120 W. 2nd St. S.
Microchips can be implanted just under the skin of dogs and cats. Veterinary, animal control, animal shelter, and local humane society professionals can then use handheld scanners—just like those used in market checkout lines—to “read” the chips implanted in animals found wandering unsupervised. The microchip provides a unique code for the pet that can then be matched against an identification database. 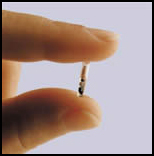 Microchip implants are one of the best ways to ensure the safety of your dog or cat. The Brookings Regional Humane Society offers microchip implanting for $20.00 plus tax per adopted dog. Cats adopted from BRHS are already microchipped. If your dog or cat was not adopted from us, the fee is $25.00 plus tax. Pet owners may call ahead to schedule a time to microchip their pet. Click here to download the microchip registration form. BRHS will do a pre-scan to verify that your pet doesn’t already have a chip. The new chip’s unique identification will then be recorded before the chip is inserted into the animal with a syringe. The injection requires no anesthetic. Before sending the animal home, we will perform a test scan on your pet. This helps ensure that a scanner will find the chip and that its unique identifying number will be read correctly. An enrollment form is completed with the chip number, the pet owner’s contact information, the name and description of the pet, and an alternate emergency contact designated by the pet owner. Our featured supporter is Animal Medical Care of Brookings. They are located at 1907 Highway 14 Bypass and can be reached by calling 605-697-5200.